Let’s set the stage a bit. You’re sitting at your desk, and the clock strikes noon. You’re starving, but don’t feel like reheating the same old “soup in a can.” You want to try something different. Problem is, you’re new to the neighborhood and don’t really know where to go. Last weekend, you got the 1AM munchies, and hit up a burger truck downtown. At the time, they were running an offer: Text BURGER to 31996 for a FREE patty and exclusive mobile rewards. Now, fast forward a week later, and you’re starving. You get one new text notification. The text message reads: Bacon n’ Burgers is at South Park today, from 1-3PM! Stop down and show this text to get $3 off your lunch order, no minimum purchase required. That one text message just simplified your entire lunchtime decision-making process. You pack up your things, and head over to Bacon n’ Burgers to cash in on that offer. What did we just describe to you? 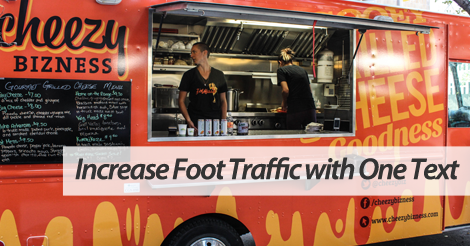 The basics of text marketing for food trucks. At the bare minimum, your food truck should prioritize the following campaigns. Reward your customers for their loyalty. Send out a mobile gift on their special day. Make mouths water with images of your best dishes. Include a special text offer with each MMS message. If you’re using text marketing as a way to communicate truck location information, don’t forget to share this info to Facebook. Join forces with a text marketing provider that makes your business growth a priority. Give us a buzz at 1.800.688.6290 to learn more, or head over to the pricing page and sign up for a free plan. Our service is easy to use, cost effective, and results based. We want you to get a return on your marketing spend. We’ll never force you to sign up for something you just don’t need or can’t afford.